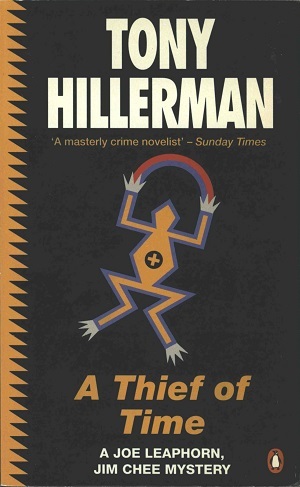 This is the third English paperback edition of A Thief of Time, published in 1993 by Penguin Books, in London, England. Penguin Books is an imprint of PenguinGroupUK that publishes highly commercial good quality affordable paperback books. The cover was designed by Instinct and depicts a Navajo sand painting stylized frog with a rainbow emerging from its fingers on a black and orange background. Binding: Full-color paper covers with the author, title, a symbol of a frog, the ISBN, and the publisher's logo printed vertically on the spine.